1. Preheat oven to 350 degrees. Grease 9x9 inch casserole dish. 2. Combine first four ingredients in mixing bowl. 3. Transfer to casserole dish. 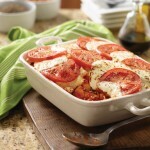 Alternate rows of mozzarella and sliced tomatoes across the top of the casserole. 4. Bake for 30 or 40 minutes until heated through.